After months of discussion, the Ann Arbor City Council stands poised to make a decision Monday on the city's budget for the next fiscal year. And how council members vote ultimately will determine the fate of police and fire protection services starting in July. Fire Chief Dominick Lanza said he's working under the pretense that cuts to the fire department are going to take effect in July. Mayor John Hieftje said he's still hoping to avoid deep cuts. He and Council Member Margie Teall, D-4th Ward, plan to bring amendments forward. "Our goal is to eliminate or at the least minimize any layoffs in police and fire," Hieftje said. "We will be asking council to support an amendment to the administrator's budget that will eliminate layoffs in the police department. We are still working on the details of the fire department section of the amendment, but we will surely ask council to support an amendment that keeps the fire stations open and maintains current response times and rescue capabilities in the event of a fire." If the council can't come to agreement, City Administrator Roger Fraser's budget recommendations will stand. And that includes eliminating 20 positions in the fire department and 20 positions in the police department starting in July. That's a scenario that would have major implications for public safety services in Ann Arbor, the city's police and fire chiefs both said this week. 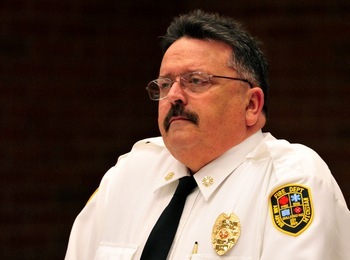 Police Chief Barnett Jones said the cuts would take 12 sworn police officers out of service. That would reduce the number of officers assigned to traffic control from five to one and completely eliminate the department's five-member Community Response Unit, while the number of officers on general patrol would drop from 64 to 61. "We will go from a proactive police department to a reactive police department," Jones said, noting he has worked to shift officers from desk jobs to patrol but is running out of officers to reassign. Fire Chief Dominick Lanza said he's working under the pretense that Fraser's recommended budget will take effect. "And we're going to have to deal with the cuts that are recommended in the budget for this year," he said. "And in doing so, it is 20 full-time employee positions, one of which is a vacant position, so it's actually 19 persons. And those number of people would require at this time the closing of one fire station." Lanza said much of what happens also depends on the outcome of collective bargaining, which is going on right now with the firefighters union. "If we were forced to close that one fire station, my recommendation would be that we go to what's known in the business as a 'rolling blackout' in the fire department," Lanza said. "And what that is is rather than showing disparate coverage in specific areas of the city, we would always keep the central station open because that is the center of the city. And then on a rotating basis — either every 12 hours or every 24 hours, on a schedule — close a fire station." The city has four fire stations in addition to the central station downtown, including one by Briarwood Mall, one by the University of Michigan, one by Arborland Mall and one on Jackson Avenue on the city's west side near I-94. "What's going to happen if we close one of those fire stations is, on a given day, if the fire station in your neighborhood happens to be the one that's closed, you're going to experience a lengthier response time," Lanza said. "Fire multiplies very rapidly, and the quicker we can get there the more effective we are in stopping the loss, so in order not to — for lack of a better term — 'pick on your neighborhood,' we have to spread that risk equally throughout the community." Lanza said residents could see insurance rates go up. National and state standards for fire protection call for having 18 firefighters on the scene of a working fire within eight minutes, which some members of the fire department claim won't be met if the cuts go into effect. "We currently have the ability to put 19 people at every fire scene on any given day," Lanza said. "That's as long as we only have one fire going. If we have two, we have to rely on assistance from other agencies that surround us." Lanza said he supports the concept of regional cooperation on fire services, something Fraser also has championed. But he said it's less reliable when other communities surrounding Ann Arbor are stressed for resources. "Ypsilanti Township just had a proposal passed by their council where they're going to be doing a buyout and reducing their workforce," Lanza said. "Ypsilanti city is in the process of looking at cuts also. Ann Arbor Township is not looking at cuts. However, their workforce is already so small. They only have one person per day on each of their two fire trucks, and then they have what's called 'paid on-call.' When the alarm comes in, those people are assumed to respond, but there's no guarantee. They have 40 of them and you could get 10 on a given day or you could get none." If the fire department's numbers are cut back, Lanza said the city needs to make sure any mutual aid agreements are carefully crafted. "I'm very concerned that the city of Ann Arbor, unless we plan it correctly ... we could come out on the short end of those kind of deals because everybody else is in even far worse condition than we are," he said. "Even if we reduce our workforce, others are going to be reducing. We're currently the largest fire department in Washtenaw County, and we still would be after reductions." The Ann Arbor Police Department has been scaled back from 191 to 124 sworn officers since 2001 — a 35 percent reduction. "There's been a lot of concern in the community that a reduction in force would result in insecurity for the community members," said Council Member Sabra Briere, D-1st Ward. "One particular concern I've heard voiced is that there would be a lack of response if people called the police and said there had been a break-in or there had been a robbery at their home." Police Chief Barnett Jones said response times could be longer if police officers are laid off. With the department scaled back, Jones said flexibility will be lost, and certain crimes will have to take priority over others. For example, if there are multiple calls for service at the same time, response times could be longer. "If another big thing happens while we're handling the 'big thing,' we've got less officers to respond," he said. "Also note that (Community Response Unit) is gone, traffic is gone, so there's no officers filling the back door. I can attempt to spread them out as much as I can, but less officers mean longer response times." Hieftje said he's interested in keeping the police department proactive instead of reactive, and that includes keeping CRU. "I recall a few years ago when we had a problem, there were some people in town that were performing some muggings in the campus area," he said. "We put the CRU on that and, within just a couple of months, that was brought to a halt." The City Council's ability to avoid some cuts to police and fire depends largely on whether the council accepts a $2 million transfer from the Downtown Development Authority. But the job eliminations in police and fire are targeted at trimming $3.6 million, so $2 million might not go as far as some hope. "If the money is not approved, then we go through with the targeted reductions, which puts less police officers on the street," Jones said, noting there currently are as many as seven to 14 officers on patrol per shift. Jones said the department also has 22 officers on special assignment. With the exception of those in traffic patrol and CRU, the rest currently don't face cuts. That includes three school liaison officers, two transport officers, two in-service detective officers, one officer assigned to the countywide narcotics team, one officer assigned to AATA, one property officer, one training officer and one court officer. 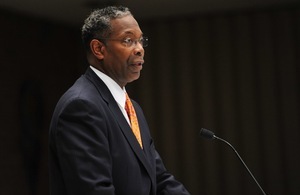 Jones said most crimes in Ann Arbor are crimes of opportunity, and with Ann Arbor being a "have" community, it's a target in Michigan's bad economy. "We're a safe community, we're a great community," he said. "So people move here and they relax here, and they enjoy the lifestyle here. And that means that they don't lock their doors, they don't lock their cars, they don't put the garage door down. "What we need to do is secure our community a little bit more, get the word out about locking the doors, cutting back the bushes, turning on some outside lights," he said. "And if we can keep the crimes of opportunity down to a minimum, we can make it safer in our community overall."